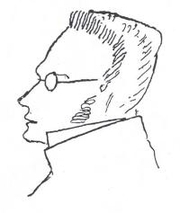 Max Stirner (1806-1856) portraited by Friedrich Engels (1820–1895), made circa 1892. The "Roots of the Right" edition of The Ego and His Own is heavily abridged and includes other writings by Stirner as well as significant editorial content. Do not combine with The Ego and His Own. Max Stirner is currently considered a "single author." If one or more works are by a distinct, homonymous authors, go ahead and split the author. Max Stirner is composed of 3 names. You can examine and separate out names.